On a Harmony based page I wish to change the H1 tag to a larger size for a page logo. Should I change this or create a new css file? I'd create a new stylesheet for your own and override styles, make sure, in the 'head' of your pages, that the link to the new stylesheet is placed below the link to p7HMY-01.css, that will help avoid possible conflicts. but changes to the style sheet do not seem to change the size of the fonts on the page. Any ideas where I may be wrong. I used em rather than px for the unit value, this will allow the media queries body rules to do their job by slightly reducing the size for smaller windows/devices. Thank you Sinclair for that information and yes it works very well. Interesting what you say about the em factor. I notice the .hmy-section before the h1 tag and wonder why that is there? On the page net100.co.uk/test.php I have placed a menu and it looks OK (but not connected yet). 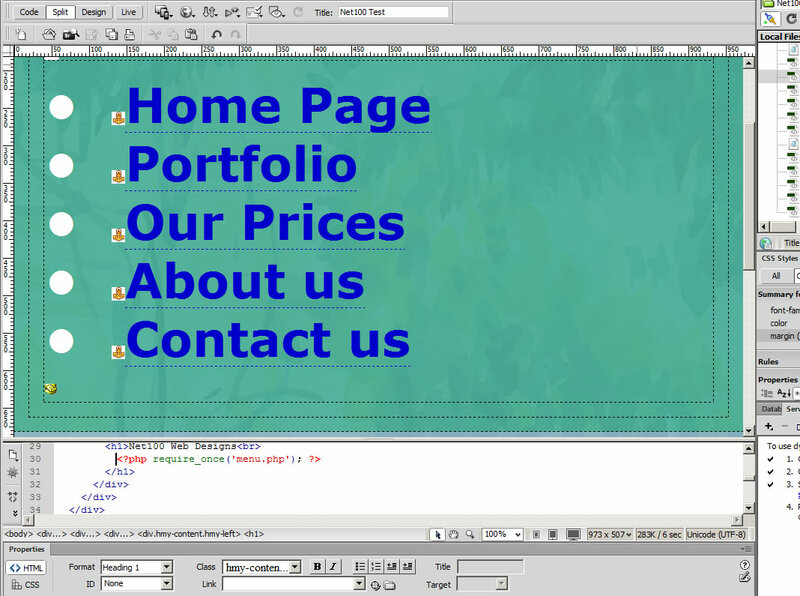 However when I created this menu in Dreamweaver the menu is much larger. I have placed an image of how it looks in Dreamweaver. Is this size correct? Why not try it live online and see how it works? Design View can do odd things in Dreamweaver and cannot be relied on to give accurate representation. It targets the h1, h2 , h3 tags specifically in a harmony construct, so supposing your layout wasn't harmony based but you had a harmony instance within, these rules target only the h1, h2, h3 tags within the harmony part of such a layout. It trumps and/or adds to the declarations in the h1, h2, h3 rules defined in the p7HMY-01 stylesheet (see the rules defined around line #298). The font-size values I gave you, should of course be edited to suit. That probably accounts for the funkiness you mention in design view. I am having some troubles with pages from a template. I am trying to get the top words Net100 Web Designs to show the same as Edit Region 1 and 2 etc. I cannot see why the top region font is not the same as the lower region font and any help on this will be very welcomed. It's important to keep the harmony structure/s intact. Vibrations is harmony based and perhaps one or more layout will do you to get your site up and running quicker without too much editing or knowledge of the css and harmony tool? In fact just studying the vibes css and the way harmony has been used for each layout might accelerated the learning process. I see Vibrations has a contact page. How does this page create the email server information? "We've included a contact form page, utilizing advanced HTML5 and CSS3 styling and client-side validation. The markup and CSS is easy to follow and you can use our CSS to style your own forms if you want. Our bonus contact form can be driven by PHP, .NET, ASP, or Cold Fusion." Regarding Vibrations, I figured that it may well save you time in order that you can get the site completed and up and running. This may allow you to learn the css/harmony tool at your leisure at a local test site then tweak the working site as you become more comfortable with the css/harmony tool. Thanks very much for you trouble. I seem to be getting over the difficulties now. Help from this forum is invaluable. Pity the form is not a working document. I realise this is an old thread but it's the same subject. http://net100test.co.uk/WA_DB234/BFSN_full/p7vibes/p7VIBES-01.css but it does not seem to respond. I have set H1 to em1 (also to 6em) but the tile PVII Vibrations: does not seem to change. I see the .hmy-section also has an H1 tag. Why is a masthead also needed? It is interesting that the H1 change does not show until the page is published. That'll style the h1 elements in the masthead specifically. The menu, it looks like the p7som fokder and associated files are not uploaded, upload those and all should be good. .masthead h1 targets only the H1 in the masthead. Don't worry about precision in how the page looks in Dreamweaver as that is simply not possible, unless you want to make a 1990s-style table layout. I don't know what else you are talking about, John. Sorry. I generated a new Vibrations page and that came out as intended so how the above code was introduced I have no idea. I believe it's a conversion issue, SOM will not convert to AMM correctly, if you were to remove everything from the SOM menu except everything berween and including the first <ul> and last </ul> then the conversion would work but the AMM would be placed at the bottom of your page as SOM is a position:fixed affair, probably not what you wanted. AMM is best situated within your structure, HMY, LBM, or whatever., you could move it manually I guess, a time saver for large menus probably. Bottom line - doing the conversion from SOM to AMM has pitfalls, not least that you will need to shift the menu manually to where you'd like it to be on your page, that is, if you take the necessary steps outlined above to generate it correctly in the first place!